As winter storm "Pax" begins it's icy trek across the southern states Heart Utilities Inc crews began a trek of their own. Only hours after returning home from assisting BG&E with their latest restoration efforts, our storm team began mobilizing to join the efforts of Georgia Power. 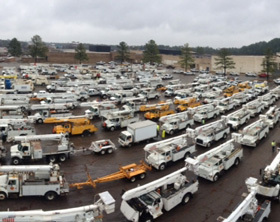 As is always the goal, a safe trip was made in short order to Atlanta Motor Speedway where staging began late today for hundreds of lineman from all over the country. With what is shaping up to be a winter to forget for most, our team has stayed resilient throughout the past three months responding to efforts in five separate winter storms. 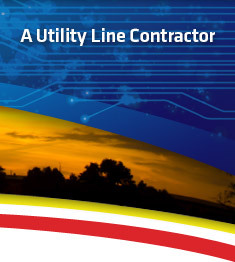 A task of that magnitude is something the Heart Utilities Inc crews should be very proud of. Employees have missed Christmas, New Years celebrations and valuable time with their loved ones. This has all been done with one goal in mind, safely and promptly restore power to our customers during their time of need. Whether it be ice, snow, wind or rain our rapid response team is always eager to exceed our customers lofty expectations of us. We once again will strive to do this as we remind everyone of the two words we live by - "Safety First". 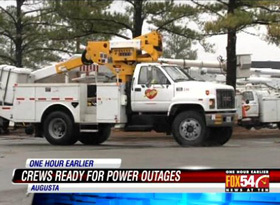 As Heart Utilities Inc crews descend upon the hardest hit areas in Georgia, Fox54 of Augusta, Georgia captured our crews beginning another 16 hour day. 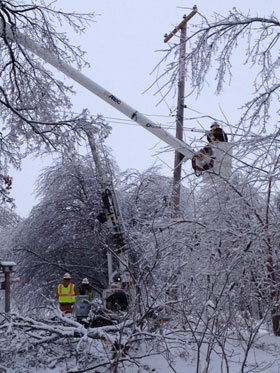 Joining three fellow contractors, hundreds of line workers began restoration efforts at what is shaping up to be the epicenter of winter storm Pax. As the process of rebuilding in the storm damaged areas of the southeast continues we will provide updates. 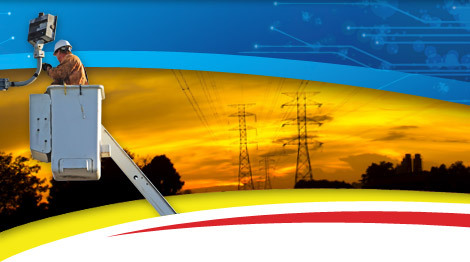 With the forecast of impending ice storm Gemini crippling the Midwest's power grid, Heart Utilities Inc has mobilized crews to assist DTE in the upcoming restoration efforts. All crews reported to Detroit, Michigan within record time in just 24 hours. Restoration projects like this have become commonplace at Heart Utilities Inc as we have maintained a rapid response team for the past 6 years and participate in emergency projects several times each year. Unfortunately for a large portion of our team, they will not be able to spend Christmas with their families. This is a great sacrifice and we would like to thank them for their efforts as they provide a vital service that will make Christmas much "brighter" for many families in Michigan. As always, we wish all employees assisting in the effort a safe trip and encourage the motto "Safety First" to each & every Heart Utilities Inc crew. 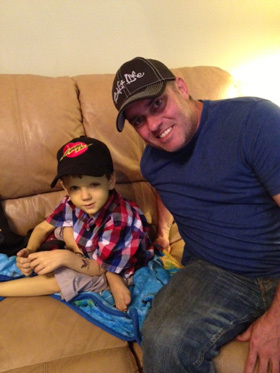 Tonight Jeannie Blaylock of First Coast News in Jacksonville, FL will be airing a news story on child cancer patient Logan, a dear friend of the Heart Utilities Inc family. I strongly encourage all of you to tune in to hear the inspiring story of this young boy's struggle with terminal cancer. As we all know the financial burden of caring for a child with cancer can be insurmountable for most families and that is why Heart Utilities Inc is asking that you all help us help the family in this difficult time. Below I have included information on how to donate to help his cause. No amount is too small and anything you can give is greatly appreciated by the family of Logan. Checks can be deposited at any Vy-Star Credit Union with the below info or mailed to the below address if you do not have access to a Vy-Star Credit Union. On Monday, November 11th the family of Logan will be having "Christmas" for him as his prognosis does not indicate he will be with us on December 25th. With that said Christmas presents can be mailed to the below address. You can also learn more about Logan on Facebook by searching "Superhero Logan". From all of us at Heart Utilities, we greatly appreciate anything any of you can give to help this cause.